Back in 2015, we started a relationship with Bee Downtown, a business, or “beesness” as they like to call it, dedicated to the growth of bee colonies across the Triangle (and now beyond). Leigh-Kathryn Bonner, a fourth-generation beekeeper and founder of Bee Downtown, started the company while at NC State University. 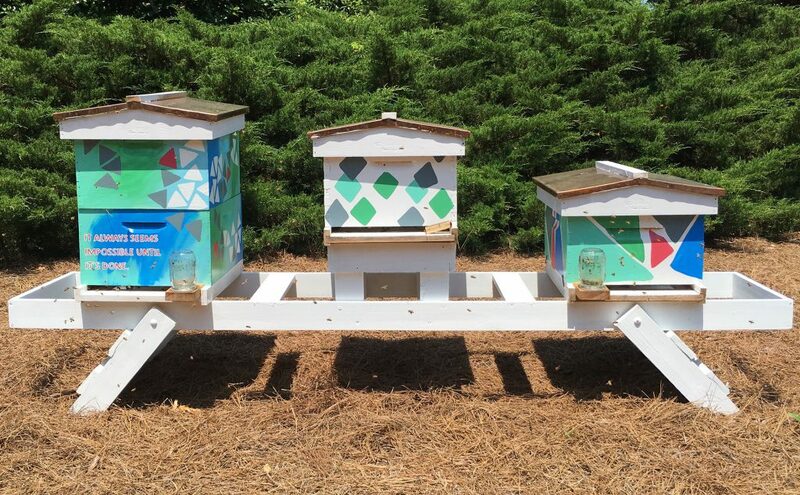 The Bee Downtown team now manages over 100 hives across the Triangle for companies an organizations like RTP, Burt’s Bees, SAS, Bandwidth and more! The Bee Downtown team uses the hives to teach employees at partnering companies, and the community, about the importance of pollinators through hands-on leadership courses and community events. Last year Bee Downtown was able to teach over 4,500 residents in the Triangle area ranging from ages 3-97 about the importance of pollinators and sustainable agriculture! Lisa Jemison, at that time our Director of Programs, saw an opportunity to take advantage of our space to host two colonies—one at our headquarters, and one at The Frontier. Before long, we had hives in place and bees doing their thing. Come last fall, we had a chance to harvest the tremendous amount of honey that the bees had produced (175 pounds!) and that’s when things got fun. Thanks to the adventurous vision of Neuse River Brewing Company’s Nathan Gastol, we were able to find a home for 100 pounds of the honey, one that would lead to the creation of the first ever Research Triangle Park beer. 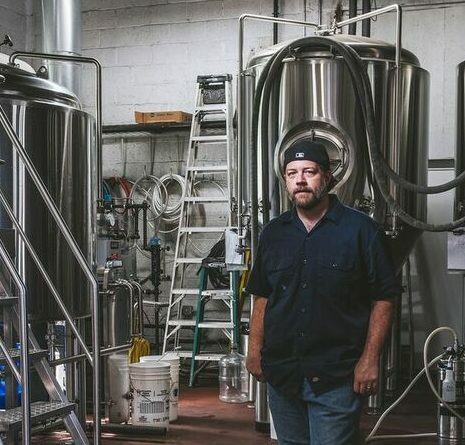 Neuse River Brewing also opened shop in 2015, and brought a focus of sustainable brewing as well as watershed protection to Raleigh’s Five Points area. Nathan has done some incredible experimentation at Neuse, mostly along Belgian-inspired lines. He toyed around with a couple style ideas for this specific beer, but settled on a witbier in the end. Rather than take a generic path towards finding a name, we used this as an opportunity to engage the communities we all serve and allow them a chance to put their stamp on this particular beer. 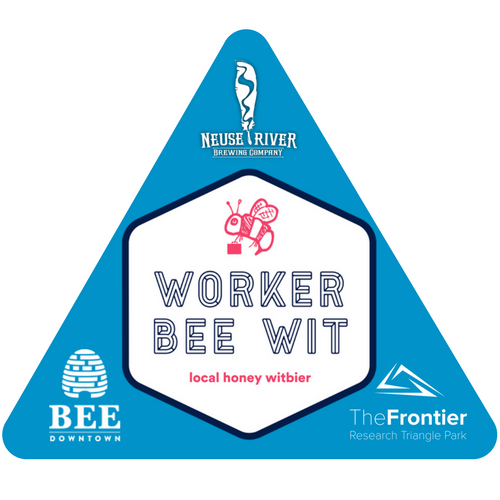 After a public contest, the name Worker Bee Wit was selected. It’s a catchy way of highlighting our industrious bees and the style of beer while also paying homage to the hard-working Frontier community, who will undoubtedly get to enjoy this amazing creation at our weekly Happy Hours. We should have enough to get us fully through spring at The Frontier. Lastly, this is just the beginning. Each year we’ll look to produce a new style with our honey, which should continue to grow in quantity as the hives expand their count. We look forward to bringing these creations to the Triangle for years to come! 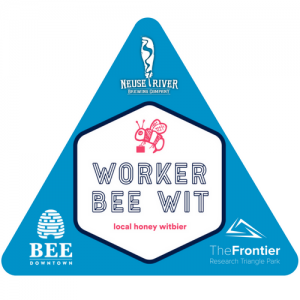 Keep an eye out for #workerbeewit mentions and help spread the word so folks can find their way to having a pint or two.